During the Feast of the 12 Days of the Nativity (Dodecaimeron), we celebrate the not so well known feast of the Circumcision of Christ. Unfortunately the pagan new year of Sol Invictus has become a global phenomenon which has overshadowed the celebration, meaning, beauty and traditions of the Feast of the Circumcision, and splitting Dodecaimeron into disjointed parts. We often hear carols for the day of the Nativity, (Christmas as it is called in the West) and celebrate this day as the only day of the entire twelve-day feast by forgetting the rest. Yet on the feast of the Circumcision, we also mark the memory of an eminent figure, who in his own way has played a considerable role in influencing history and our modern day concept of social justice and welfare support. 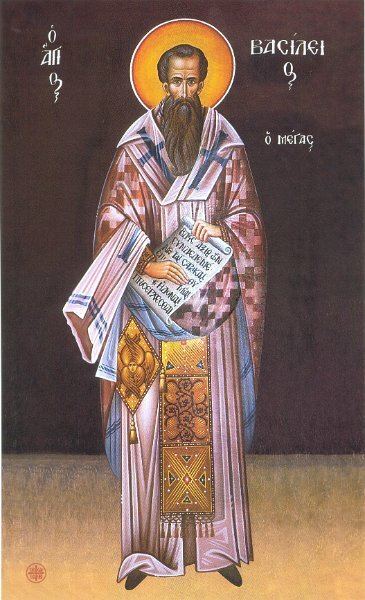 The figure in question is Saint Basil (Vasilios) the Great, Bishop of Caesarea in Cappadocia, Asia Minor (modern-day Turkey). In this one fiery, but calm and serious man, we find eminent philosopher, theologian, practitioner of medicine and law, philanthropist, clergyman, pastoral-carer, social-worker, ascetic, confessor of the Faith and obstinate opponent to tyranny. To very few does so many epithets ever belong to one distinct person, and yet his life is like that of legends. Within the Greek homelands and diaspora beyond, Saint Basil has been honoured by many folkloric traditions which developed to revere his memory in popular conscience and hold him out as an exemplary model for clergy and laity. In his own Greek homeland of Cappadocia, numerous songs and dances were created and are still practiced to this day by Cappadocians on major days like Pascha (Easter), the Nativity, Epiphany, the Ecclesial New Year and on his own feastday. Interestingly, even after centuries of assimilation, persecution, displacement and genocides, the Turks of Cappadocia, who are the descendants of Islamised Greeks, unwittingly still preserve many of these dances and customs that honour Saint Basil the Great. Of course they have attributed different meanings and words to these dances and customs, but they still remain as the memory and legacy of that great man of God. However, one particular but humble custom which can be traced back to Saint Basil himself, has endured the test of time, that of “vasilopita” (Basil’s Bread). There are many differing accounts as to how this beautiful tradition came about, and from all indications, was not a one-off instance. Some stories relate about how there were families who were so poor they could not afford for their sons to pay the bridal price or supply their daughters with a dowry, so that they could marry. Saint Basil reportedly sought a way to supply these bridal prices and dowries via supplying bread that was filled with silver and gold coins. Others relate how some families were unable to support their members and sought to sell themselves into slavery or illegal and immoral professions in order to feed themselves. Again Saint Basil was able to avert such human tragedies by anonymously supplying gold and silver coins through bread distributions. Whatever the case is, we know that Saint Basil himself would make the breads and also establish agreements with bakers throughout his diocese to supply sweet bread to the poor and needy, which were filled with the various gold and silver coins. In this way, the philanthropic work would remain anonymous and avoid vagabonds taking advantage of charity. Yet the other reason for supplying the money in this manner was to avoid people returning the money out of shame, because the typical Cappadocian phronema (mindset and behaviour) would usually object to “handouts” as public tokens of disgrace and recognition of their impoverished status. In short, it struck at the Cappadocian sense of dignity and honour. Thus Saint Basil wanted to ensure that those who were in need, were supplied with the means to survive and invest in their future, without causing offence or public humiliation, nor drawing attention to himself as the benefactor. Therefore, on his very feastday, Orthodox Christians till this day, have continued to commemorate this humble act of philanthropy that Saint Basil did all those centuries ago, by preparing the same bread which he made, and cutting it up at the communal meal at church or in the family home which would proceed after the conclusion of the day’s church services. For this reason we now call this sweet bread, vasilopita, that is “Basil’s bread”. 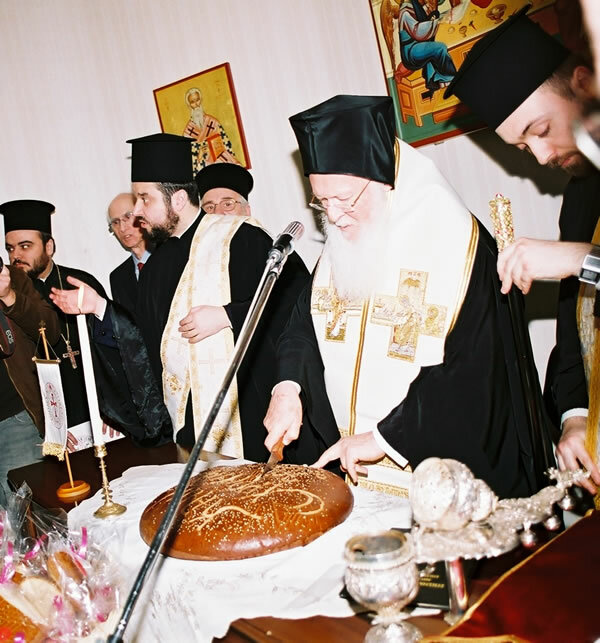 The bread itself would usually have been brought to church to receive the priestly blessing at the conclusion of Divine Liturgy. The local church parish would have a large communal vasilopita which it would cut up and distribute amongst parishoners. As for the remainder of the vasilopites they would be taken home or to the community gathering to be cut by the most senior member of the family or community. The senior member would say a very short prayer of thanksgiving and asking for the petitions of St Basil to request God’s blessing to be bestowed upon all present. They might even recite the Apolytikion (Dismissal Hymn) of St Basil, and then they would proceed to cut a small circle in the middle of the bread in remembrance of Our Lord and Saviour Jesus Christ. Then they would proceed to cut the bread according to pie shape slices. The first of these pie-shaped slices would be dedicated to the Virgin Mary, and the second pie slice would be dedicated to St Basil. From there on, a slice would be made for the entire family or community, the most senior member present till the youngest, and portions would be cut for the Church, the home, the visitor, the traveller and the poor. 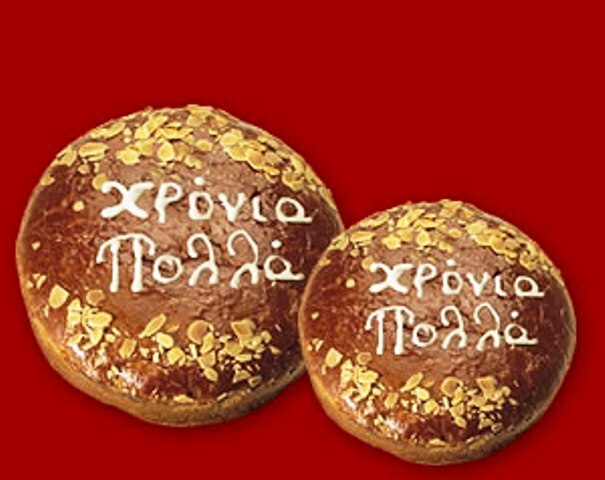 The order may vary slightly from place to place, but the custom is that the member who cuts the vasilopita proclaims aloud to whom the piece is dedicated to and offers it to them. The person who receives the gold or silver coin, is considered to be the one whose prayers will be particularly heard, since that year till the next vasilopita cutting, will be one of particular blessedness for them, and by extension, one in which they must strive harder to become a faithful servant of Christ like Saint Basil was. Dissolve the yeast in 1/3 cup tepid water (37.78 Celsius or 100 Fahrenheit). Add 1-2 tablespoons flour and stir well. Cover and let it stand 10 minutes to rise. Meanwhile, sift the flour, baking powder, salt and flavourings into a kneading basin and make a well in the centre. Put in sugar, milk, slightly beaten eggs and yeast. Gradually pull the flour from the sides of the well into the liquid until it is all incorporated. Knead until a soft, elastic dough is formed. Cover with plastic wrap and let it rise in a warm place until doubled in bulk, about 2½ hours. Punch down the dough. On a floured surface, roll out the dough into a about a 91.44 centimetre (36 inch) long cylinder and coil it into a spiral on a baking paper placed on a baking sheet. Slip a coin wrapped in foil. Cover with a kitchen towel and leave the bread in a warm, humid place until doubled in bulk, about 30 minutes. Brush the top with the egg yolk mixture; then stick in the halved almonds following the spiral’s pattern. Bake in a 204.4 C. (400 F.) oven for 20-30 minutes, until golden brown. Cool the bread on a rack. To keep it moist, store covered with plastic wrap (or moist tea towel), until used. Cream the butter with an electric mixer. Add the sugar and beat them together until the mixture is pale and fluffy. Stop beating. Add the orange rind and baking soda mixture. Then gradually add the flour in stages, alternated with the orange juice, folding in gently and working by hand to form a soft and easy to handle dough. Roll the dough into a cylinder about 91.44 cm. (36 in.) long and coil it into a spiral on a greased baking paper, placed on a baking sheet. Slip in a coin, wrapped in aluminium foil, so that it is well hidden. Brush the top with the egg yolk mixture, then stick in the pine nuts following the spiral’s pattern. Sprinkle with the onion seeds, if desired. You may also pat the dough in a 30.48 cm. (12 in.) round baking pan lined with greased baking pan lined with greased baking paper. Smoothen the surface with your palms and pinch with two forks to make a pattern. Pin on top a few cloves and brush with egg yolk mixture. In Smyrna, housewives use to stamp the bread with the double-headed eagle, symbol of the Byzantine Empire. Bake in a 193.3 C. (380 F.) oven for 30-35 minutes or until the surface is golden brown. Cool on a rack. To keep it moist, store the bread covered with plastic wrap. Cream the margarine and sugar with an electric mixer. Beating continuously add the eggs, one at a time, alternated with a tablespoon of flour to prevent curdling. Lower the speed to minimum. Add soda with brandy, lemon juice and rind. Then add the flour in 3-4 stages, alternated with the yoghurt. Put the dough into a well-greased, 35.56 cm. (14 in. ), round cake pan and bake in 176.7 C. (350 F.) oven for approximately 1 hour and 15 minutes, or until a wooden skewer inserted in the centre of the bread comes out clean and dry. Let the bread cool 5 minutes in the pan. Then unmold and transfer to a serving dish. 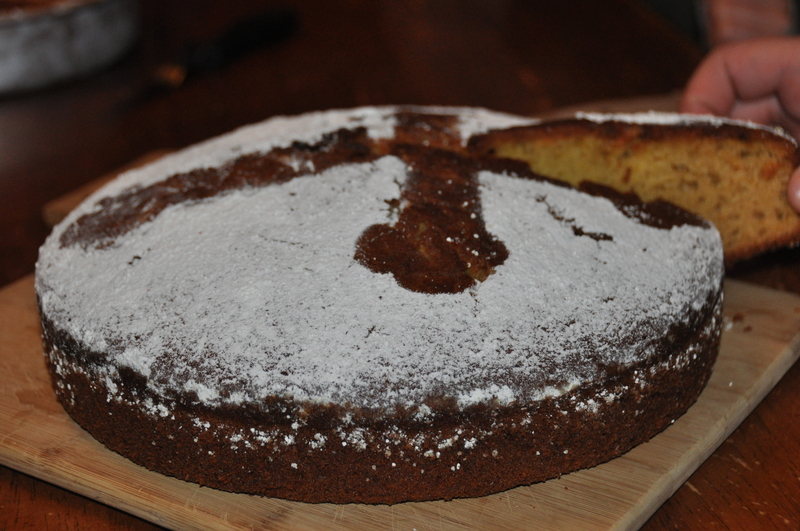 While still warm, place a laced paper doily on top and sift Icing Sugar over it. Carefully remove the paper. The designs will remain on the top of the bread. Wrap a clean silver coin in foil and push it up into the bread from the base. Sift the flour into a large mixing bowl. Add the cubed butter and rub the mixture with your fingertips until it resembles coarse meal. Dissolve the soda and cream of tartar in brandy. Set aside. Lightly beat together milk, flavouring, eggs and sugar. Pour the mixture into the flour along with the brandy and knead lightly, to form a soft, flaky dough. Avoid over-kneading. Set a small piece of dough aside. Push in a coin, wrapped in foil, and press the remaining dough into a 30.48 cm. (12 in. ), round baking pan lined with greased baking paper. Poll out the reserved dough on a floured surface. Using tiny cookie cutters, cut out season’s decorative shapes and stick on bread’s surface, brushing with the remaining egg yolk mixture and bake in a 176.7 C. (350 F.) oven for 30-35 minutes or until golden brown. Cool on a rack. To preserve bread’s texture, keep it covered with a plastic wrap, until used. Prepare the filling. Blanch the sliced onions and chopped leeks and drain well. Heat the butter with the oil in a heavy pan, and sauté the meat cuts over high heat, turning them to brown all over. Add the drained onions and leeks, salt, pepper and a little cinnamon, if desired. Cover and simmer until the meat is tender and juices are reduced to about one cup. When cool, cut the meat in small pieces and mix with the eggs. Set aside. Grease a 35.56 cm. (14 in.) round baking pan. Divide the puff pastry into two equal portions and roll them out into two thick sheets the size of the pan. Place one of them over the bottom of the pan and spread the meat mixture on top. Put in a coin wrapped in foil. Cover the filling with the remaining puff pastry sheet, moisten the edges and press firmly together to seal. Prick the surface with a fork, in a designed pattern, to decorate and to allow the steam to escape while the pita is baking. At this stage, you may freeze the pita, if desired. Thaw it before baking. Bake the pita in a 176.7 C. (350 F.) oven for 35-40 minutes. Serve warm. Dedicated to all those who are named after St Vasilios (Basil) the Great and thus celebrate their name day on his feastday on the 1st January, may God grant you health, peace, joy and above all, the same wisdom of your patron Saint. May his petitions to the Lord on your behalf secure the patience, forbearance and progress in all your endeavours which are according to God’ will and pleasing to that will. For the rest of you, all I can say is “kali orexi” (Bon appetite) and hope that you secure the vasilopita coin for this coming year. We should note that there are carols for each feast day of the twelve day festal cycle. The most prominent and well known are those of the Nativity, and to a lesser extent, those of the Epiphany. That is plural for vasilopita.